Always find what you want with Walter Drake and good quality. very comfortable i sit in my rocker and read sometimes for several hours at a time nothing gets sore from sitting for long times. Color matches decor very well. 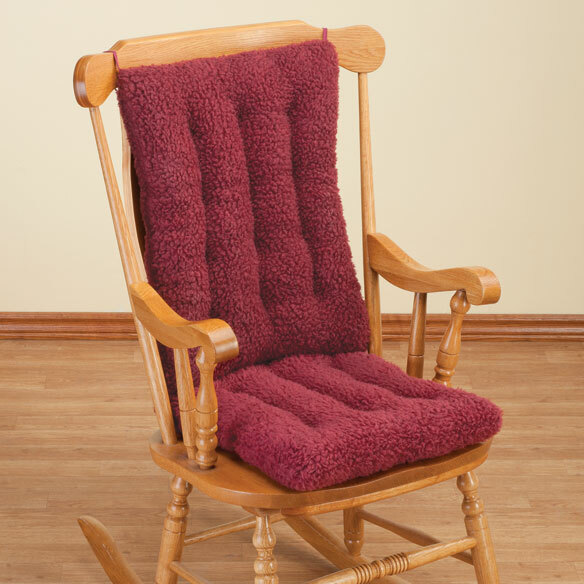 Product is used on a maple rocking chair in our family room. It is soft and comfortable. I do not have any negatives to report on this article. Good quality, but wish it was a little thicker for more comfortable seating. I needed rocker cushions and found this in the catalog. Some stores don't carry rocker cushions. A very cushy sherpa fabric, but too deep a pile for my tastes. I suspect it would collect dust, get crushed down with use, and be difficult to keep clean. I am returning the product. The cushions were so thin you hardly knew you had any! Just to warn anyone else this fabric is terrible. It always looks a mess. With pieces of lint etc. that you can't brush or shake off. You have to pick it off. There were no other options for fabric when I ordered. I have only had the set a little over a month. It looks so tacky it is embarrassing. I would like to return it! BUT my son took it to college with him. He thinks it's ugly too but states his bottom won't mind! product looked very cheap. very disappointed. I purchased these to put in my dinning room chairs. I was very disappointed with the material. It is too soft and furry. It catches everything onto it. The tie strings come apart from the cushions quite easily. No matter how well one ties the straps, the cushions move about in the chair. They do not make for a comfortable seating. You have to keep readjusting them beneath you bottom. I am very disappointed and they cost much more than they are worth. Best selection of all I found on line. I wish you didn't add on fees at the end. Had I known I might not have selected this. Hoping to replace current cushions. This looked soft and fluffy. Just what I was looking for and local stores did not have it. I got a nice rocker at a thrift store but have been looking for a one piece cushion, found it! It looks comfy and was available in the color I wanted. 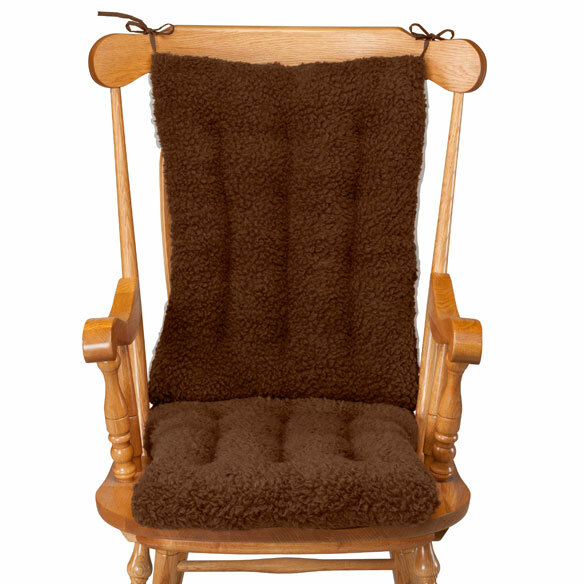 This Sherpa rocking chair cushion is for my 12 year old daughter's room that we just did over. It looks very comfortable and cozy. Picked for an old rocking chair being passed down for my daughter in law for her baby shower. Need another set of cushions for my chair. Can't find a set like this in stores. 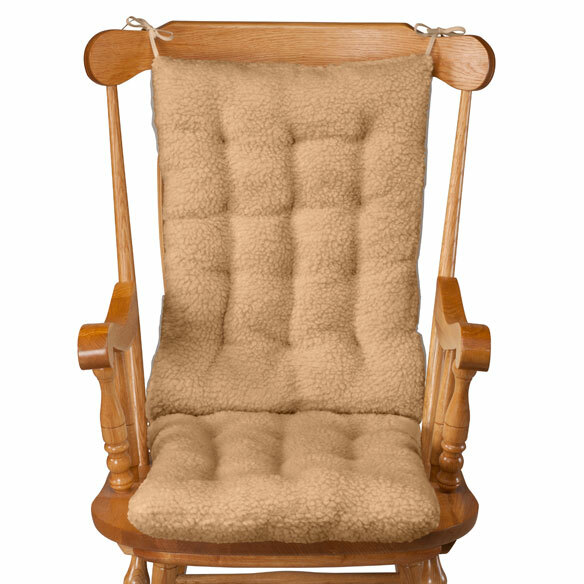 We have an antique rocker for our babies nursery and wanted a comfortable cushion set for it. 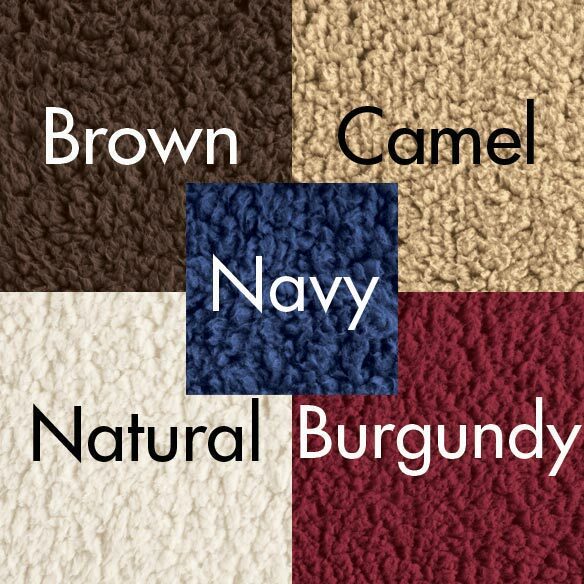 We are hoping this product will be perfect for his room!!! Looked good in the catalog. Much thicker than one we presently have in the chair. Need cushion for my rocker. What material is this chair made out of - the outside as well as the stuffing inside? BEST ANSWER: Thank you for your question. The cushion is made of polyester and has 100% polyester fill.We hope this information will be of help to you. Does it come in gray.? BEST ANSWER: Thank you for your question. 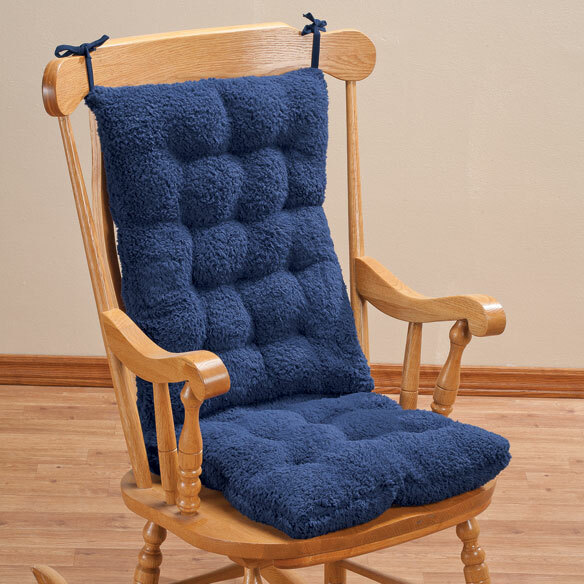 At this time the Sherpa Rocking Chair Cushion set does not come in grey. We hope this information will be of help to you and apologize for any inconvenience. are these cushions one piece? No. Each cushion has separate ties to fasten to chair. does this have a non-skid back? Also, does it contain any foam? BEST ANSWER: no to both questions. can the other side be use also ? BEST ANSWER: I just went to verify this and the answer is yes. It has the same design on both sides. Yes. These cushions are double sided. DO THIS CHAIR PAD SHEID? BEST ANSWER: Thank you for your question. No, it does not shed. We hope this information will be of help to you. My seat measures 19 wide and 16 deap. don't find any that size. What size cushion should I get? BEST ANSWER: Thank you for your question. Please refer to the dimensions in the description and order accordingly. We hope this information will be of help to you.